Restoring Travertine is a multi-step process. In order to get the finished product desired the stone must be ground down, honed, sealed, polished and buffed. Most people are pretty familiar with what it means to seal, polish and buff stone but why must the stone be ground down and honed first? What is honing? Grinding the stone is a very important step that is also known as “flattening” or “lippage removal.” Most people who elect to have their natural stone ground down do it to avoid unsightly lippage and achieve a flat and uniform surface. Grinding it down softens all edges and roughness leaving you with a much higher quality looking product. Honing is the step of floor restoration that smooths and corrects the stone’s surface with special grit of diamond pads that make the stone surface smooth while not creating a super glossy finish. This is done in a process of repeated grinding and rubbing of the stone’s surface in an abrasive manner, much like sandpaper to wood. The natural state of Travertine is very porous and usually these surface holes are filled before honing. Honing your floors and counter tops will give the stone a very natural look, but, you must make special effort to clean up any spills as soon as possible to avoid damage to your honed surfaces. Honing is your best chance to remove deeply etched scratches, penetrated stains and help to give a more uniform appearance to the stone. In some cases honing is the only step required to bring back the beautiful appearance of stone. 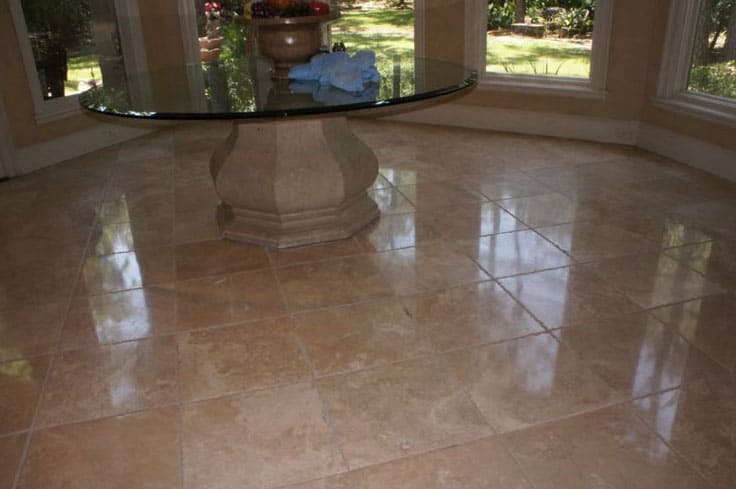 Honed travertine is used for a large variety of applications. Honed tiles are typically used for wet indoor areas such as kitchens and bathrooms. It’s also perfect for showers, patios, flooring, and counter tops as it is more resistant to water. What is the difference between honed and not honed stone? Honed lacks the shininess and reflective qualities that polished stone has. Instead, it has a more satin-feel, smooth and velvety to the touch.